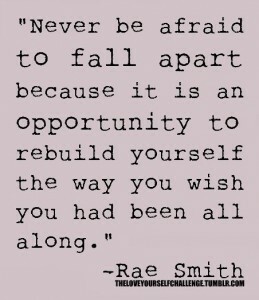 There’s a beauty in falling apart. In the raw, unfiltered explosion of emotion that’s been there for so long but tucked away behind the smile. Truth always feels good. Even when it hurts. Even when it makes us want to slide down onto the kitchen floor and wrap our arms around our knees and just sit there–tears streaming. Truth just wants to be heard. Pain is our body’s way of asking for attention. Truth always feels good. In the middle of the tears and wave after wave of pain or despair, there is an uprising. A rising up of the part of us that was beneath what we were holding back, holding at bay. Beneath all of that holding and tension is ease, strength, and peace. Beneath the holding and tension is joy. Our inner light is our strength. And it’s dimmed when we hide what we feel–when we forge ahead, despite the need to collapse. Despite the need to let the waves of emotion wash over us. When we hold ourselves back, we hold back our light and our strength. Strength is ignited by truth.